Many a broadband customer has been excited to pay extra money and upgrade their service to new high-bandwidth technologies that promise they’ll be able to download movies and music in just seconds. However, a nearly equal number of broadband customers have also been dismayed when, once everything is hooked up, they rarely seem to get anywhere near the amount of bandwidth their ISPs claim to be selling them. Now the UK’s telecommunications regulator, Ofcom, has released research looking at nearly a dozen broadband packages that represent about 90 percent of broadband subscribers in the UK. The results? The average download speed available to broadband users is still less than half the “up to” speeds advertised by most providers. 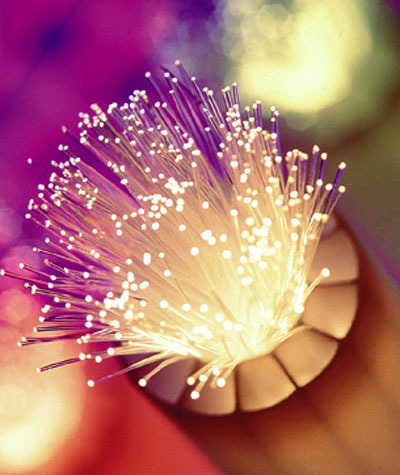 Ofcom’s research represents the first time the agency has looked at so-called fiber-to-the-cabinet services. Although the study found that fiber- and cable-based services were generally able to offer average download speeds closer to advertised speeds—BT’s fiber service managed 78 percent of advertised speeds, while Virgin’s cable service managed from 90 to 96 percent of advertised speeds—the results were still disheartening, with many services not even found to provide half the bandwidth they claim to be selling. And performance during peak hours (8 to 10pm on weekdays) declined to even lower levels. 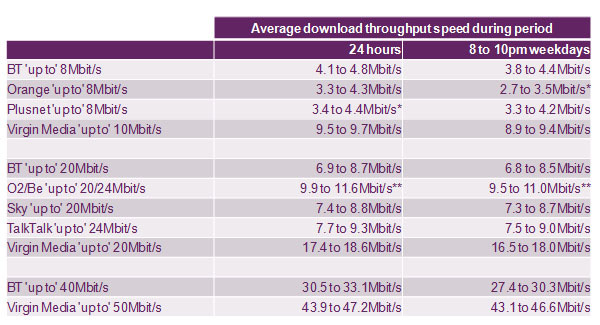 BT’s Infinity service offered the best upload speeds of the bunch, with average upload speeds of 8 Mbps, “significantly higher” than any other measured service. Copper-based services like DSL fared even worse, with DSL packages claiming to offer up to 20 Mbps connections averaging just 6.9 Mbps, or 29 percent of the advertised speed, and “very few” (about three percent) of customers achieving speeds even close to advertised bandwidth. Can anyone challenge the iPad 2?